Insights to Behavior takes the ABC data and behavior assessment results and generates suggested strategies to customize behavior intervention plans. Insights to Behavior allows users to select from research-based Proactive Strategies, Replacement Behaviors, and Reactive Strategies. Gain access to practical research-based tools for productive classrooms that include Continuing Education tools, training, and resources that empower educators and set students on a path to success. 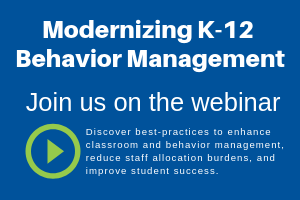 Equip classroom educators to correct and prevent specific behavioral issues with video-based professional development skills training that’s available on-demand. Keep students on-track with resources for social and emotional support that when implemented in the classroom improve a student’s attention, emotional regulation, adaptability, and social understanding. The student’s team can edit and customize research-based strategies to meet the needs of individual students without searching the internet or consulting a PHD.